Alcorn, Stephen. A Gift of Days: The Greatest Words to Live By. New York: Atheneum Books for Young Readers, 2009. 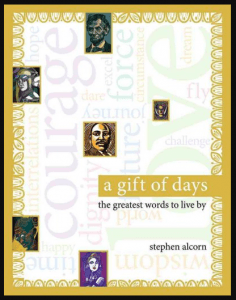 A collection of quotations from well-known noteworthy people, one for each day of the year and arranged by birthdate. Illustrated by an award-winning artist and appended with biographical information, A Gift of Days is recommended for reflective people 10 years old and up. “We are what we pretend to be, so we must be careful what we pretend to be.” Kurt Vonnegut Jr.